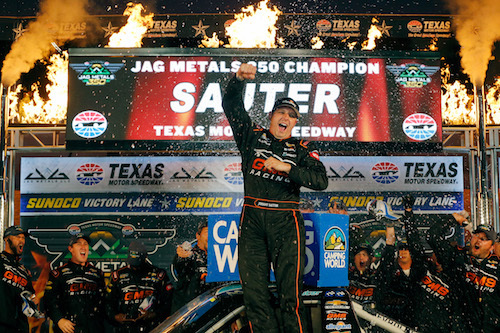 Johnny Sauter celebrates in victory lane at Texas Motor Speedway after winning the Jag Metals 350 on Nov. 3, 2017 (photo courtesy of Getty Images for NASCAR). The past week has been tops for reigning NASCAR Camping World Truck Series champion Johnny Sauter. On Wednesday, he and his wife experienced the birth of their fourth child, a girl. Friday night, he capped off the week with his win of the Jag Metals 350 at Texas Motor Speedway, his third Truck Series win of 2017 and the fourth of his career at Texas. The win clinched Sauters spot among the Championship Four in the Nov. 17 season-finale at Homestead-Miami Speedway and was the 400th win for Hendrick Engines. Fellow-playoff drivers Austin Cindric and Christopher Bell finished second and third, while Chase Briscoe and Justin Haley rounded out the top-five. Another playoff driver, Matt Crafton finished ninth, marking his 13th-straight top-10 finish at TMS, a record for most consecutive top-10s at a specific track. The other two remaining playoff drivers, Ben Rhodes and John Hunter Nemechek suffered pit road-related struggles late in the race. Meanwhile, John Hunter Nemechek’s team, in a win or be eliminated mindset, went into fuel conservation mode, planning to run the entire 77-lap final stage without pitting. Those plans were aborted, though, on lap 134. Running on fuel, his truck stalled on pit road, lengthening Nemechek’s time on pit road. Rhodes and Nemechek, as a result, wound up 18th and 19th at the finish. Haley started on the pole and led the first 25 laps of the race, surpassing the 12 laps led throughout his entire Truck Series career, to date. He was passed for the lead by Christopher Bell just before the second caution of the race on lap 26. Pit strategies varied throughout the remaining laps of the race that saw the yellow flag wave five times, included the two yellows that separated the race into its stages of 35, 35 and 77 laps. Bell was among the drivers who stayed out during the lap-26 caution and won the first stage that ended nine laps later. He, then, pitted between the first two stages, handing the lead over to Matt Crafton. Sauter also was among the drivers pitting between stages one and two. He lost positions on pit road when he took extra time for replacement of his truck’s rev limiter chip. Crafton lost the lead to Myatt Snider on the restart, and Sinder led until Noah Gragson got by him on lap 64. Gragson drove on to the stage-two win on lap 70. Cindric and Sauter were among the two drivers who stayed out between the second and third stages to restart on the front row for the final two stages. Cindric drove away as Sauter and Haley battled for second throughout the early laps of the final stage. Sauter came away with the position, and on lap 109, he took the lead from Cindric.